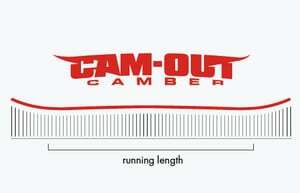 Cam-Out Camber – Nitro's Cam-Out Camber is a classic camber shape but with early and smooth transitions into Tip and Tail. The result is a fun and responsive board that turns on the spot and is forgiving, even after that 713.5° landing! All Terrain – Nitro's most versatile flex pattern combines Nitro's signature pop with smooth response for tearing up the entire mountain. Radial Sidecut – The simplest and most common of all sidecuts: one single radius makes this sidecut extremely versatile and predictable. Power Core – Power Core uses tip-to-tail poplar wood that provides lightweight strength and the perfect blend of flex, response, and feel. Bi-Lite Laminates – Nitro's rider-trusted Bi-Lite Laminates are engineered for a powerful riding style and a refined board-feel. Sintered Speed Formula HD Base – Nitro utilizes a new base material compound to achieve higher abrasion resistance, increased wax absorption, and higher on-snow speeds.